Bats in your attic or bat in your house in Virginia? 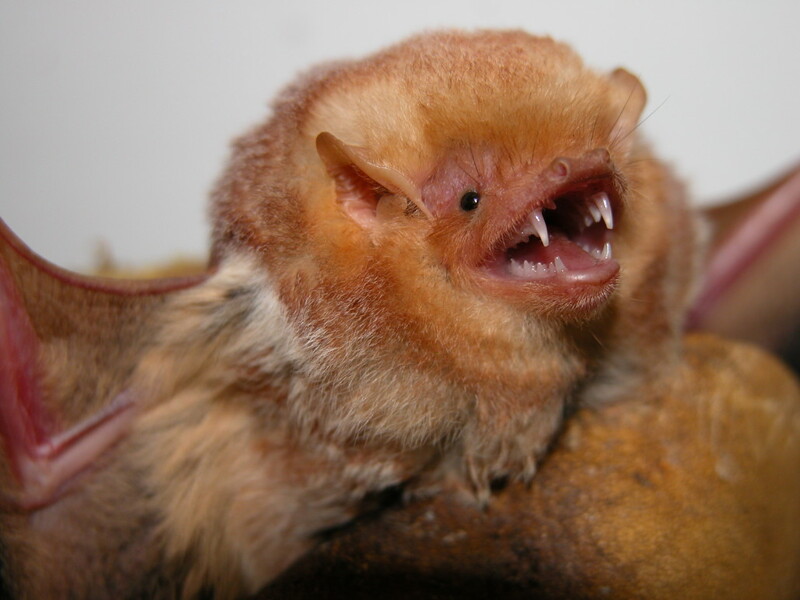 The Eastern Red Bat species is medium sized with a total length of 3 1/2 to 4 3/4 inches long, and is bright red to rusty, with long, silky fur. This is one of a few bats with contrasting color sexes. The female is dull buffy chestnut with much frosting. The male is almost orange-red. Mating likely occurs in late summer or autumn and the sperm is stored in the female’s reproductive tract until spring when ovulation and fertilization occurs. In June, females usually give birth to three or four young and then roost with their young until they are weaned. Males roost alone throughout the Summer. High temperature demands associated with gestation and rearing young may limit the northern range for reproductive females. Eastern red bats often roost amongst live or dead leaves on the branches of live hardwood trees, but have also been found using loblolly pine trees in pine plantations. There are 1-5 young per litter, that are born in late May to early June. This species is solitary except sometimes during migration and foraging. It roosts 4-10 feet above the ground, and roost sites are used by different individuals on different days. They forage over a regular territory (approximately 100 yards) nightly, and may forage 600-1000 yards from their day roosts. They migrate south from September to late November. The Eastern Red Bat is common throughout the state of Virginia. They are highly migratory, and migrate southward in autumn, but migration patterns and magnitude are unknown. This is a tree dwelling species that lives mostly in dense foliage, tree hollows, under loose bark of dead trees and rarely in caves. In late summer, eastern red bats from the northern parts of the range may migrate south for the winter, although little is known about migration routes or overwintering range. In winter, red bats forage for insects on warm nights and even warm days. On warm days during the winter, red bats enter torpor while roosting in the canopy of hardwood or coniferous trees, but during cold bouts they crawl underneath dead leaf litter on the ground and use their furred tail as a blanket. The Eastern Red Bat feeds among trees in the forest, around lights in towns and on the sides of barns. They take both hard and soft insects. During the winter they feed heavily on flying insects, including beetles, cicadas, flies and crickets. For fast, safe and humane Virginia Bat Removal contact us at (804) 729-0046 or toll-free at (888) 824-7383. Call us for more questions on the Eastern Red Bat in Virginia.